Well now. Things have been a little interesting. Two missions in two days. The first was to the north end of Skye to take some background shots for an article in Scottish Island Explorer magazine. An estimable publication well known for it’s beautiful photographs of the western isles. No pressure there then. The task was to help illustrate an article about a crofter in Glendale who is also the local postie. Something that is not at all uncommon hereabouts but makes a good story nonetheless (one of our neighbours did the same thing until his recent retiral from the Royal Mail, indeed another neighbour was not only a crofter but also had time to be a taxi driver, ambulance driver, owned a caravan site, ran a shop and was a special constable in his spare time. Oh, and managed to have 5 children too. And they say life is lived at a slower pace up here.). The idea was to take some nice shots of the area, show the rugged beauty of the place, some local character. I had many ideas prepared. All of them needed dry weather to work. How naive am I? So it’s obvious to us all what the weather did to my plans. Boy, it was really wet that day. And windy, very windy. Lots of heavy rain showers with that lovely Skye drizzle constantly smearing lenses and filters between the showers. Just what I needed. A quick prayer to Saint Veronica (patron saint of photographers) and the clouds parted long enough to get a few shots. Mainly of pillar boxes and sheep. Not exactly what I had wanted, no majestic mountains or inspiring vistas but Veronica probably knew I wasn’t Catholic so didn’t put much effort in on my behalf. It was however great fun and the Assistants liked the new territory with all its fresh and strange sniffs. The magazine used two of our photos. 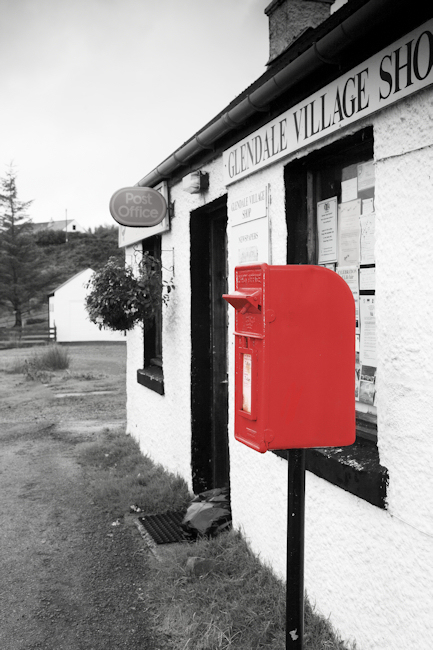 One of a pillar box, with added sheep, this is Skye and you get some sheep in almost all photographs (I’m expecting one to want to sign a release form soon) you want them or not and another of Glendale post office. Scottish Island Explorer. A magazine of our beautiful islands, produced by enthusiasts for enthusiasts. Give it a try, you will enjoy it. I’m not saying that just because it used two of our photos. Nor am I saying it because it did a little piece about us and used another of our photos. We already liked the magazine before that. We really like it now though. The next afternoon I was walking the Assistants at Irishman’s Point near Broadford. Quite near but still a bit of a hike as it is a bouldery shore that dogs find easy and humans just look clumsy on. My phone rang and when I answered it the Boss told me that Margaret had told her that Murdo has the prawns and that they have to be shot this afternoon. Margaret and Murdo are friends of ours who are opening a deli called Buth Bheag in Kyle of Lochalsh soon ( I asked what Buth Bheag meant and the withering look of pity I got in return put me firmly in my place. It means little shop and is pronounced boo vake). The Boss had volunteered our services to do some publicity shots for them. I had agreed as I was to be allowed to eat the subjects of the shoot after it was over. I hope this practise doesn’t catch on; Little People Portraits Skye could become more infamous than famous if it did. As the deli is to have a seafood basis the subjects of the shoot was to be local shellfish. So as the prawns, crabs, scallops etc had to be as fresh as possible the window of opportunity was a small one. I had felt like an expectant father or a lifeboatman, ready to drop everything and run. I half expected a flare to go up. What colour of flare is fired for the-prawns-are-ready-get-to-the-viewpoint-overlooking-the-Skye-Bridge? There was no flare just the phone call but I was, as sods law would demand, at the most awkward place available, so I lurched my way along the shore and dashed off to Kyle viewpoint and my rendezvous with a plate of shellfish. The shoot was fun and Margaret and Murdo set out a lovely platter of local delicacies. Prawns, crab, scallops and squat lobsters, all on a bed of ice, and they not only looked good but were also a more than generous reward. The viewpoint in Kyle made a suitably grand setting for the pictures, the bridge being an easily identifiable and picturesque backdrop.